NASHUA, Iowa — The annual Easter egg hunt sponsored by Nashua Women of Today is this coming Saturday, April 15, and is offering more than chocolate and other goodies. Children can be registered in drawings for 12 baskets donated by local businesses. 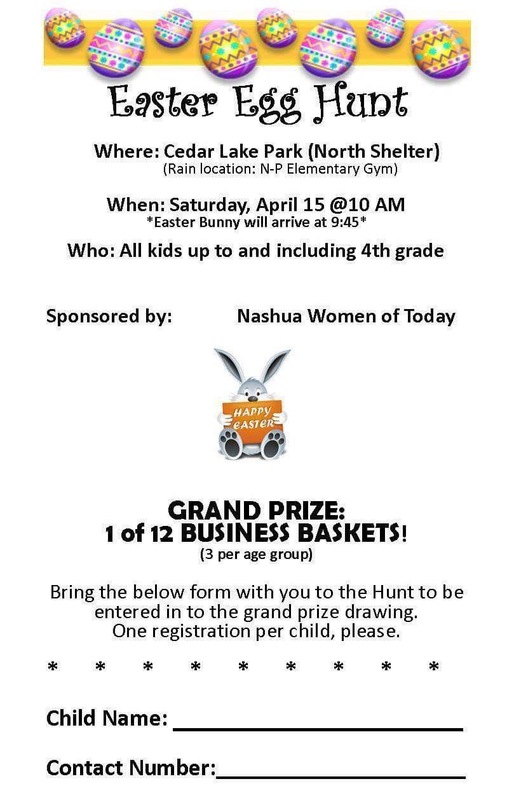 9:45 a.m. — Easter Bunny arrives and children can be registered in drawings for 12 Grand Prize Easter Baskets sponsored by Nashua area businesses (Registrations will be sent home from school and available the day of). 10 a.m. — Children set forth on the egg hunt. 10:05 a.m. — Pickup a treasurer bag and (last chance) to register for a chance to win a Grand Prize Easter basket. Every child will leave with a goodie bag and have the chance to win one of 12 grand prize baskets (3 per age group), a news release said. After the hunt get your picture with the Easter Bunny, stick around to see who wins the Prize baskets, and then head over to Heroes Read Too: Reading is Our Superpower! at the Nashua Library from 11 a.m until 1 p.m. This entry was posted in Nashua and tagged Easter, eggs, Nashua Women of Today. Bookmark the permalink.